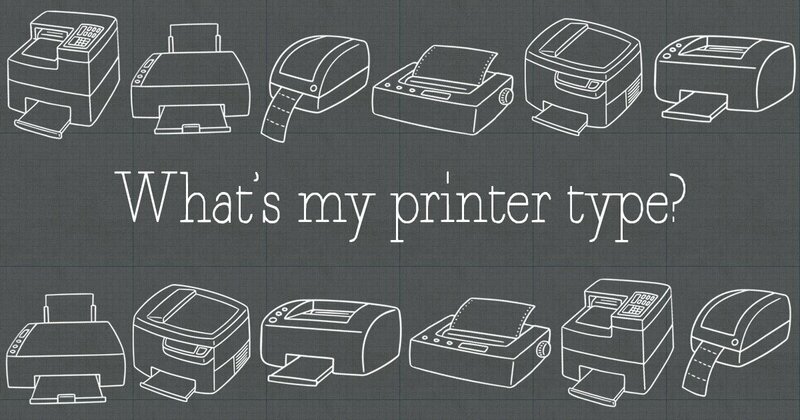 When it comes to printing, it's important to know your printer type. That information is also crucial when ordering supplies, operating your printer, and maintaining it. To determine what type of printer you already own, we'll start by asking one question. The biggest differentiator between printer types is whether or not you buy sheets or rolls for your printer. Which do you buy? If it's large and bulky, it's most likely toner from a laser printer. Inkjet printers generally have smaller cartridges. Touch it after it's been running. Laser printers use a laser to fuse images onto paper. This will result in a hotter working temperature than inkjet printers which don't create heat when releasing droplets of ink onto your paper. Run your finger across a newly printed sheet. The ink from inkjet printers will likely smudge immediately after printing, since it hasn't yet had time to dry. You can also search the web using your printer's model number. Check the front, top panel or look for the printer's barcode to find it. Both places should include enough information to point you in the right direction. Learn more about laser vs. inkjet printers. There are mounts for two rolls. You have a thermal transfer printer. The first mount is for the labels, the second is for the roll of wax or resin-based ribbon. There is a spot to insert ink cartridges. If you buy both small cartridges of ink and rolls of labels, you're using an inkjet roll printer. There is only enough room for my roll of labels. Direct transfer printers only need a roll of labels to create your printed product. If you don't need to buy supplies like ribbons or ink, you are using a direct thermal printer. If you're still unsure, try searching the web. A quick search of your printer's model number will often give you all the answers you need. To find the model number, check the top panel or look for the printer's barcode. Both should include enough information to point you in the right direction. Learn more about the difference between thermal transfer and direct thermal printers or find out why you should choose an inkjet roll printer. Once you've figured out your printer type, you have the most important piece of information you need about your printer. You can now confidently buy the paper, labels, and supplies you need knowing they're compatible with your machine. For more printer help, label support, or questions, contact our customer service team at 1-888-575-2235. Use these tips to better align your label sheets with your label design.